The story of Slippurinn goes back to 2011 when me, one of my sisters and my parents had this idea of opening a small restaurant on the island where we're from. It started out as a cute idea of opening a casual yet modern restaurant supporting local economy but it turned out to become a really big restaurant and it totally transformed our lives. Slippurinn is located on Heimaey one of the islands of Vestmannaeyjar (The Westman Islands) it's located in an old machine workshop called MAGNI which was used to service the old shipyards, it's the oldest concrete building on the island but it hadn't been in use for over 40 years when we took it over. My father, Auðunn Arnar Stefnisson, is a fisherman and a really talented handyman. 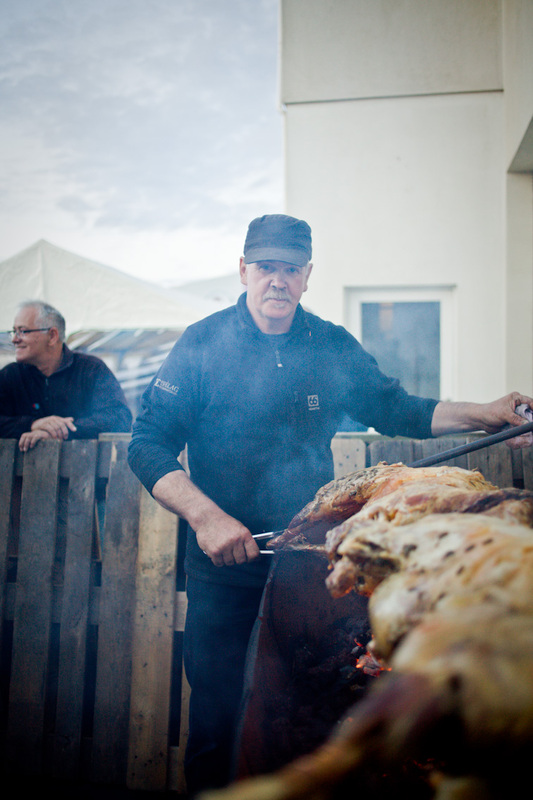 He provides the restaurant with fresh fish of amazing quality and he prepares our dried baccalao according to our old icelandic tradition. His handyman skills really come in handy as well since there are a lot of things that need attention in an old house like MAGNI. My mother Katrín Gísladóttir supports the restaurant with numerous herbs & flowers she grows in her greenhouse, being the mom that this restaurant needs and serves our customers with her warmth and attention. My sister Indíana Auðunsdóttir designed the place, is in charge over the front of house, our cocktails and so much more. Without them there is no way Slippurinn would come even close to what Slippurinn is today. I know that I will never do a project that is nearer to my heart then Slippurinn is. To do something from your very own terroir and also with your family makes things a little more special. We opened our doors the summer of 2012 and we haven't looked back since. Our goal since day one has always been to serve local and seasonal food of the highest quality possible and create an ambience & atmosphere to remember yet be serving not just few but many people seven days a week. Our cliental has been from day one mostly locals proud to have such quality restaurant at their island as well as both Icelandic & foreign tourists. Each summer we add knowledge and use it to become better every year, we're only open 4 months a year so we use this winters to travel, work on other projects and get inspired. We're young and really ambitious and we love the Islands. Produce is harvested locally, we work with fisher mans, farmers and small producers and we're always working towards becoming more and more sustainable.